Tired of purchasing numerous different devices to stay competitive and meet your customers demans? Viora’s V30 multi-technology platform is specifically designed to meet these challenges and more. Viora specializes in providing you with the most advanced technologies within one platform, so you can expand your practice as you need and on your time. By combining multiple technologies, the V30 multi-technology platform enables you to offer multiple applications to your patients. Each technology is accessible via a different handpiece, and can be acquired separately, so you control your treatment menu. For vascular lesions, skin rejuvenation and focused hair removal. For hair removal, skin rejuvenation, hyperpigmentation, vascular lesions and acne clearance. The V-IPL handpiece has five interchangeable filters, ensuring complete treatment coverage for all skin types and conditions. The V-IPL handpiece is driven by PCR™ technology for targeted pulse configuration. For skin tightening utilizes Viora’s proprietary CORE technology with three individual RF channels and a fourth channel incorporating all three frequencies for greater depth penetration and control. 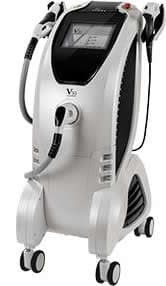 For skin resurfacing, skin rejuvenation and acne scar clearance uses Viora’s innovative SVC™ technology of switching, vacuum and cooling gives physicians greater control by delivering unprecedented penetration depth control and allowing practitioners to determine the desired biological response. Viora capitalizes on the advanced and proprietary technology within V30 by delivering the most effective results possible, quickly, safely, painlessly and with little to no downtime.